I have been drawn to 12 inch “Tank” fans ever since I became a collector for several obvious reasons. I believe the name was coined due to their large motor housing which holds the stator and large rotor (and start switch). In addition, they run very smooth and strong, like tanks! They have brass on brass meaning they are made from a brass cage and brass blade with the rest of the fan being cast iron. They have three speeds, they’re very attractive looking, I have yet to change a bearing, they come equipped with a centrifugal start switch (I love to hear the clicking of the start switch during power up and power down), and they come in many different varieties. Earlier versions of “Tank” fans had brass oil cups, stenciled Westinghouse badges, and bullet type or round acorn nuts. The later variety of Westinghouse Tanks came equipped with an etched badge and steel oil cups with round acorn nuts. Westinghouse was the original manufacturer, but they private labeled the design to many different manufactures including: Shedd, Western Electric (under the names Victor and Hawthorn) and Robbins and Myers. All with distinct characteristics including different motor badges and cage badges. It is a Tank collector’s dream to own all of the varieties with the Victor and Shedd being the most rare to find in my experience. 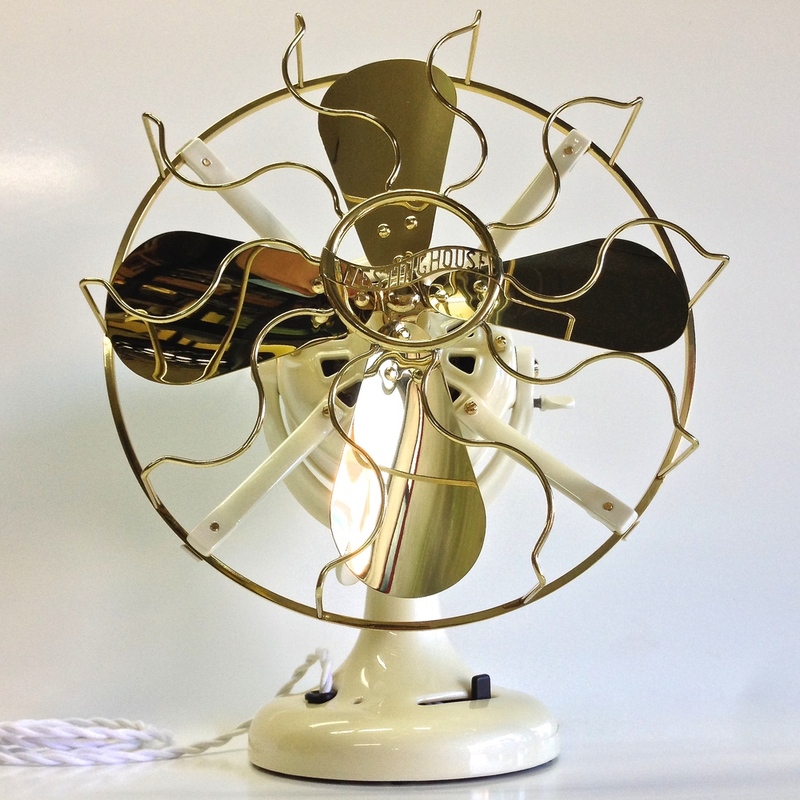 The basic tank motor and stator design were also used on the desirable Lollipop and Vane fans that were sold by Westinghouse, R&M, and Western Electric (under the Victor and Hawthorn brands). 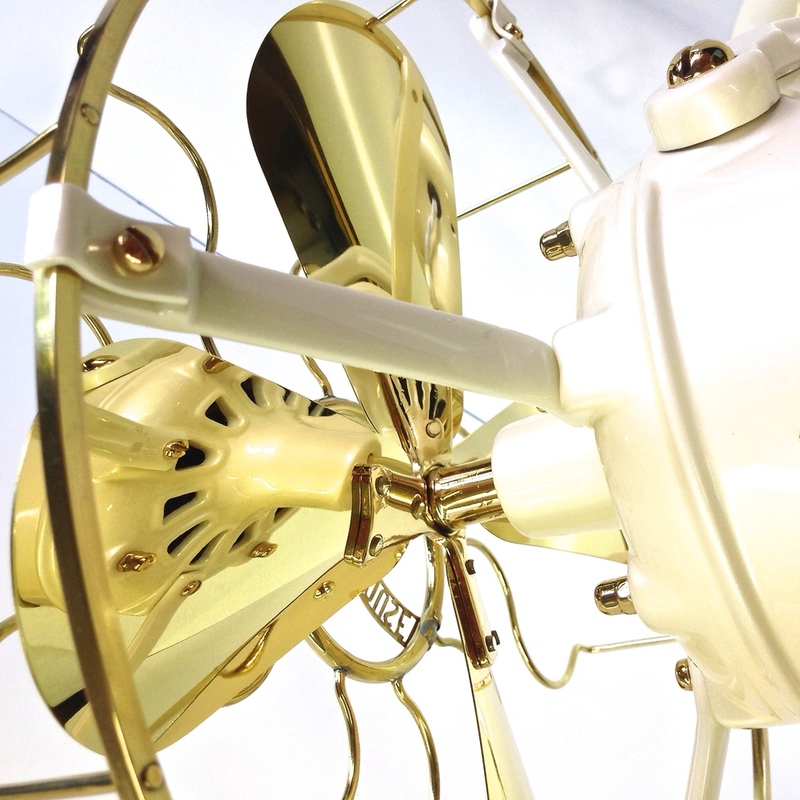 Restoring these fans is an absolute joy and I have restored several of them; everything from full restorations to polishing of the original paint and brass (link to our polishing blog). Please enjoy the photos of this earlier Westinghouse “Tank” fan restoration. I decided to give this fan a well-deserved pearl paint job (moonshine white pearl). It has since become one of my daily runners and I feel the tank fans are well suited as such: they’re still relatively cheap to buy and I’ve yet to come across one that doesn’t run. Unrestored rust bucket tanks go for under $200 (as of 2014) with the rarest of the bunch going for under $500.